With Swamp Thing Vol. 6: The Sureen, writer Charles Soule has gotten past getting to know the character in the first volume of his run and clearing some of the series's detritus in the second, and finally (with only one volume left) this series gets on the move. Quite all of the sudden, Soule has a viable new supporting cast for Swamp Thing, a handful of credible threats, even a guest star or two. It's rare to encounter real surprises on the comics page but Soule got me a couple times; also there's first-rate art here from Jesus Saiz and Javier Pina, each of whose work is so flawless and so similar that it gives the book a shining, consistent look throughout. Again, in Swamp Thing Vol. 4: Seeder, Charles Soule basically established who Swamp Thing was, and in Vol. 5: The Killing Field, he pitted Swamp Thing against the Parliament of Trees with the ultimate goal of putting them to rest. Killing Field, in my opinion, required some amount of drudgery to get to this point, but Sureen starts with an appreciably more "lightweight" Swamp Thing -- less mythos to get bogged down in (especially of the fantastical sort) and more action and character. The book reminded me, with good reason, of Anne Rice's Vampire Chronicles novel Tale of the Body Thief; the tone is one of modern sci-fi and horror rather than the previous book's fantasy. What impressed me most about Sureen was its reversals. 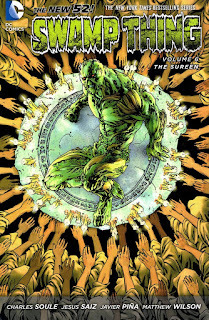 Soule introduces the Sureen, apparently a religious group that aids the Green avatar and even allows the avatar to possess a human body for a while. All of this is explained, in somewhat comical form (there's an element of sexual humor underlying it all), by past avatars both friend and foe, so the reader is given to believe it's true. For that reason, when no sooner does Swamp Thing body swap before the Sureen rips off fake beards, tosses Swamp Thing's body in a bag, and absconds with it, Soule had my jaw on the floor. He had me again later in the book when Swamp Thing's seeming ally and mentor the Wolf is revealed as behind it all. I thought Soule's use of Vandal Savage here was especially notable. Savage is a villain, of course, but Swamp Thing's ally Capucine treats him as a friend, and indeed Savage helps them on the way to recover Swamp Thing's body. That Soule uses Savage in a non-villainous way suggests the morally gray ground that Swamp Thing and his friends are on, which seems more tonally appropriate for these "dark" characters than being a subgroup of the Justice League. This book's Aquaman crossover acquits Soule and Swamp Thing better than writer Jeff Parker and Aquaman; Aquaman comes off pigheaded (a problem in the series at that time) while Swamp Thing is uniquely reasonable for a comics character. But the star of the issue is Jesus Saiz drawing the gorgeous ocean scenes. Saiz's Aquaman alone is impressively majestic, but moreover his undersea Swamp Thing seems to almost shimmer like seaweed in the waves. It rather seems DC has lost Saiz to Marvel, which is a shame, as he's been one of my favorite artists for years now and the crossover issue shows exactly why. Swamp Thing Vol. 6: The Sureen is a fine return to form for the Swamp Thing series, lacking only perhaps the previous volumes' horror, but there's even some of that in the final issue. With the next volume, both Charles Soule's run and the New 52 iteration of Swamp Thing ends, and I very much wonder if we'll keep the Alec Holland Swamp Thing; I've enjoyed this iteration by Scott Snyder, but I have a suspicion this non-traditional take on Swamp Thing is not going to last to the next series.